Oregon is a leading state for gemstone production with sunstone, thundereggs, opal and more. Two specimens of Oregon Sunstone: The specimen on the left is a round cabochon weighing 2.29 carats and about 7mm in diameter. It is a stone that is heavily included with visible platelets of copper. Those platelets are what reflect light to produce sunstone's aventurescent effect. The specimen on the right is a clean faceted stone weighing 1.01 carat and 7mm x 5mm in size. It is an oval-shaped stone with a strong orange color. Oregon is one of the nation's leading states for the production of gemstones. These gemstones are mostly a result of the state's long volcanic history. Oregon's famous sunstone is produced from basalt flows, thundereggs are formed in rhyolite, and the silica that produced much of Oregon's opal, agate, and jasper was dissolved from volcanic rocks by hot groundwater. In the sections below we feature Oregon sunstone, thundereggs, opal, and the chalcedony gems of agate and jasper. Oregon has many other gems, which include obsidian, garnet, jade, steatite, wonderstone, and many varieties of petrified wood. Oregon produces some of the best gem-quality feldspar in the world. The name "Oregon Sunstone" is used for gem-quality feldspars from Oregon, with and without aventurescence. They can be found in colors that range from clear through yellow, orange, pink, red, green, and blue. Multiple colors are often found in the same crystal, making bicolor and tricolor stones possible. Some specimens of Oregon Sunstone contain microscopic copper platelets suspended throughout the material. These platelets are often in alignment within the stone, and light entering the stone at the proper angle will simultaneously reflect from them. When these stones are played in the light, bright copper-colored flashes are produced as the stone passes through the angle of reflection. Flashes can also be observed by moving the light source or changing the angle of observation. This interaction with light produces the phenomenon known as aventurescence. Sunstone is cut into faceted stones and cabochons. Material with platelets is usually cut to produce flashes of light when the stone is viewed in the face-up orientation. To do this, the copper platelets should be parallel to the top and bottom of the stone. Quality material cut by a skilled artisan is so attractive that the State Legislature named Oregon Sunstone the state's official gemstone. The sunstones are found as phenocrysts in a small number of basalt flows. This makes production a labor-intensive job. They can be screened by hand from soils which have developed above the basalts. Hard-rock mining of the basalt is sometimes done, but it is less successful because the feldspar cleaves easily and breaks during extraction. 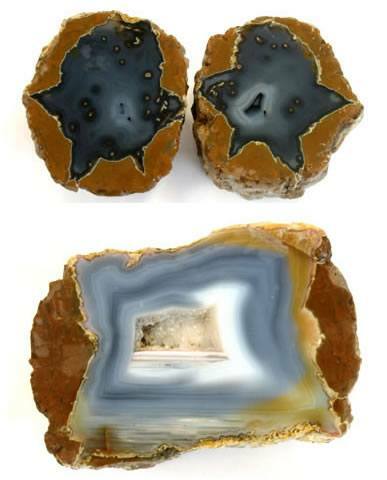 Oregon Thundereggs: Examples of thundereggs sawn to display their interior. The top two are halves of a single egg about three inches in diameter. It is filled with gray chalcedony with gray agate and drusy quartz in the center. The bottom is a half egg about six inches in diameter with gray banded agate around the outside, white agate towards the center, and a drusy quartz cavity in the center. The most popular rock in Oregon is said to be the "thunderegg." Thundereggs are "nodules" or "geodes" that form when agate, chalcedony, or opal precipitate within the cavities of rhyolite, welded tuff, or perlite. 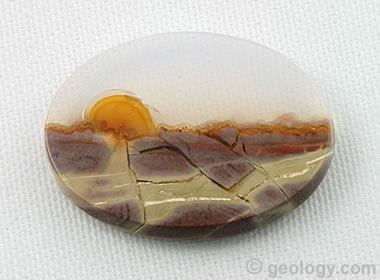 Thundereggs can be ugly on the outside; however, when they are cut or broken open, a treasure of colorful gem material and crystals is often revealed. Thundereggs range in size from less than one inch to over three feet in diameter. The mystery of breaking or sawing thundereggs to see what is inside is a large part of what makes them so popular. They frequently contain layered or fortification patterns of colorful agate, sometimes with a drusy quartz-lined inner cavity. Other specimens contain clear to milky or mossy chalcedony. Oregon has one of the best places on this planet for finding obsidian, a volcanic glass and a mineraloid that is usually black in color. The location is Glass Butte and Little Glass Butte and surrounding areas in central Oregon. There, about 4.9 million years ago, volcanic domes and rhyolite flows produced some of the most spectacular obsidian varieties that you will find anywhere (see photo). If you go there you will certainly find the typical black obsidian. You also have a chance to find exotic varieties like gold sheen (an aventurescent obsidian), rainbow (an iridescent obsidian), mahogany (a black and brown swirled obsidian), pumpkin (an orangey variety), and double flow (a black and orangey material swirled together). For collecting details see the Deschutes National Forest website. Fire Opal: A faceted orange fire opal from Oregon. This stone weighs 1.17 carats and is 9mm x 7mm in size. Fire opal in a range of colors from yellow through orange and red is produced from several mines on the eastern side of the Oregon Cascades. A number of different types of opal are found in Oregon. An area known as Opal Butte in Morrow County has produced hyalite, hydrophane, crystal, contra luz, fire, common, dendritic, and other varieties of opal. Although some of the opal found there is unstable during cutting, a number of great gemstones are still produced. A small fraction of Oregon thundereggs are filled with opal, and a smaller fraction of those contain gem-quality material with play-of-color. Some contain a blue opal known as Owyhee Blue that ranges from a blue gray to a brilliant sky blue. Some contain common opal with beautiful scenes and patterns like the cabochon pictured. The hope of finding opal or colorful chalcedony is what drives much of the thunderegg popularity. Owyhee blue opal: A cabochon cut from blue Owyhee opal mined in the Owyhee Mountains in eastern Oregon, near the Oregon-Idaho border. 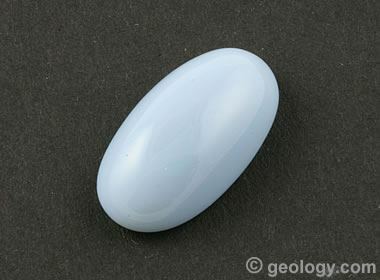 Some of the opal from this area looks like chalcedony and occurs in a range of pale blue to medium blue colors. This stone is 20 x 11 millimeters in size, weighs 8.05 carats, and has a fantastic powder-blue color. Picture Opal: This is a spectacular cab cut from the opal center of a thunderegg. If you look closely, you can see the sun rising over a landscape that is underlain by normal faults. This nice cab was cut by Aaron Buell of West Coast Lapidary. Polka Dot Agate is one of the most interesting agates found anywhere. It is a blue to white to yellow agate with suspended dots of many colors. It was first mined by Native Americans who knapped it to produce sharp tools like blades, scrapers and projectile points. It is still mined today in central Oregon. The mine has been open to the public for fee digging. During those times you can enter the mine, look for agate, and keep what you find for a fee. 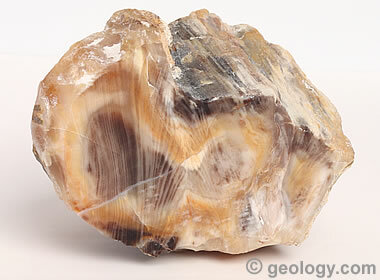 The volcanic history of Oregon has produced a wide variety of agates and jaspers. Widely known Oregon agates include: Graveyard Point, Priday Ranch, Eagle Rock, Holley Blue, Richardson Ranch and Polka Dot. Widely known Oregon jaspers include: Biggs, Bat Cave, Blue Mountain, Morrisonite, Chicken Track, Deschutes, Spiderman, and Sucker Creek. 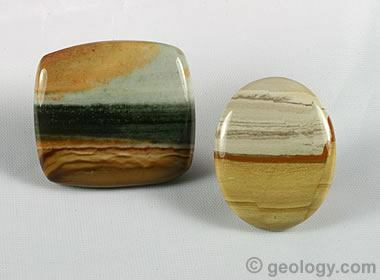 Wild Horse Jasper: Two cabochons of Wild Horse Jasper cut from material found in Oregon. The cabochon on the left is 33 x 36 millimeters in size, and the cabochon on the right is 27 x 34 millimeters. Wild Horse often produces cabochons with interesting landscape scenes. Oregon Beach Agate and Jasper: A beautiful mandala composed of colorful beach agate and jasper pebbles found along Oregon beaches and brought to a bright polish in a rock tumbler. This mandala was created and photographed by Amanda Nachman, who has an Etsy Shop named Oregon Coast Agates. A popular activity along Pacific coast beaches is hunting agates and jaspers that have been tumbled in the surf. Some of the beaches have names such as "Agate Beach" that reveal what you might find there. Rivers draining the volcanic landscape of the western side of the Cascade Mountain Range carry large numbers of agate nodules of various sizes and dump them into the ocean. Then waves pick them up and roll them around in the surf. This action rounds the agates and gives many of them a natural matte finish. 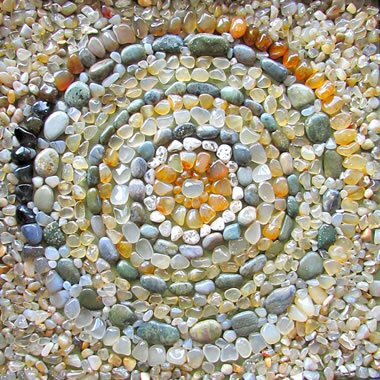 A great time to look for agates is after a large storm, when streams have dumped more agates into the ocean and waves have disturbed the sand to expose agates that have not been found by people. Agates found on Oregon beaches are often nicely rounded and can easily be used to produce nice polished stones in a rock tumbler. Oregon Petrified Wood: A nice piece of opalized wood from one of Oregon's many petrified wood localities. It has wonderful color, visible wood grain, and has been brought to a nice polish. This specimen measures about three inches across. Petrified wood is found at many locations in Oregon. Much of this wood has an origin related to eruptions in the Cascades volcanic range. Over millions of years of geologic time, volcanic blasts occasionally knocked down large areas of forest and covered them with volcanic ash. Non-explosive eruptions also repeatedly buried large expanses of forest under thick and extensive volcanic ash falls. Over time, rainwater soaked down through the ash and dissolved some of its silica. That silica was carried downward into the soil by the descending waters. It later precipitated as chalcedony or common opal in the cell cavities of the wood. This is the origin of much petrified wood found at many locations in Oregon. The wood is often colorful and attractive. Petrified wood of high quality can be cut and polished into beautiful cabochons. It can also be used to make bookends, desk sets, jewelry, tumbled stones, and a variety of other lapidary projects. These items make great souvenirs and gifts that support the local economy and spread the story of the ancient forests of Oregon. Lightbox Advertising: This is one of the early online advertisements promoting the sale of Lightbox Jewelry. It appeared on Geology.com and many other websites in January and February of 2019, before the Lightbox manufacturing facility in Oregon was opened. 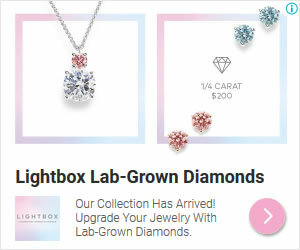 It clearly communicates that Lightbox will be selling lab-grown diamonds in pink, blue and "white" colors. We receive no compensation for displaying the ad above, and have no agreements or relationship with LightboxJewelry.com. In May 2018, De Beers announced their plans to start Lightbox, a stand-alone company that will sell lab-created diamonds in earrings and necklaces. The diamonds will be available in blue, pink, and white colors, in sizes of 0.25, 0.50, and 1 carat. All three colors will be sold for $800 per carat plus the cost of the jewelry mountings. De Beers' initial intent is to focus on the fashion jewelry market. The jewelry will be sold online with possible retail sales in the future. The announcement shocked the diamond jewelry industry. De Beers is going to sell products that will compete with their mined diamond business at prices that are at least 50% lower per carat than the current going prices for lab-created diamonds. Each diamond over 0.2 carats will be inscribed with the Lightbox logo. De Beers will invest $94 million to build a production facility near Portland, Oregon, that will start producing about 500,000 carats of rough lab-grown diamonds per year in 2020. The diamonds will be cut and polished by a company in India, with an expected yield of about 200,000 carats of polished diamonds per year. Who would have expected Oregon to be one of the world's leading synthetic diamond producers?